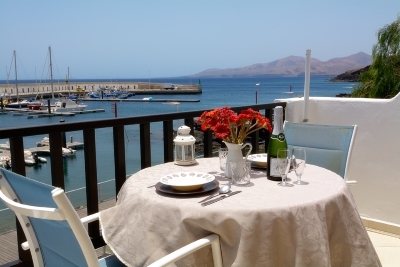 Apartment Flores is one of three lovely front line apartments overlooking the old harbour in the Old Town of Puerto del Carmen. Each apartment has fantastic sea views, as well as views of the neighbouring island of Fuerteventura. The apartments are laid out over 2 levels with the bedroom on the lower level with a spiral staircase leading up to the living area upstairs. The entrance is also on the upper level. There are 2 balconies on each level. The photos on the website are of all three of the apartments. The actual apartment will be allocated to clients on arrival, according to availability. Because of the enviable position, the amenities are very close by, such as the nearest restaurant is 100m, and the nearest supermarket is 120m.